Most noted for his artworks like the “Last Supper,” “Mona Lisa,” and “Vitruvian Man,” Leonardo was more than an artist; he was the quintessential Renaissance Man. He was an engineer, anatomist, inventor, and visionary the likes of whom we have not seen since. From the books and programs that I’ve studied on Leonardo, I knew that he was born an illegitimate son to an Italian notary and received very little formal education. However, he was a keen observer of nature and life, and wore a sketchbook attached to his belt so that he could draw and write down his observations. Some 7,000 pages of his notebooks have survived, most of which were written backwards and could only be read in a mirror. 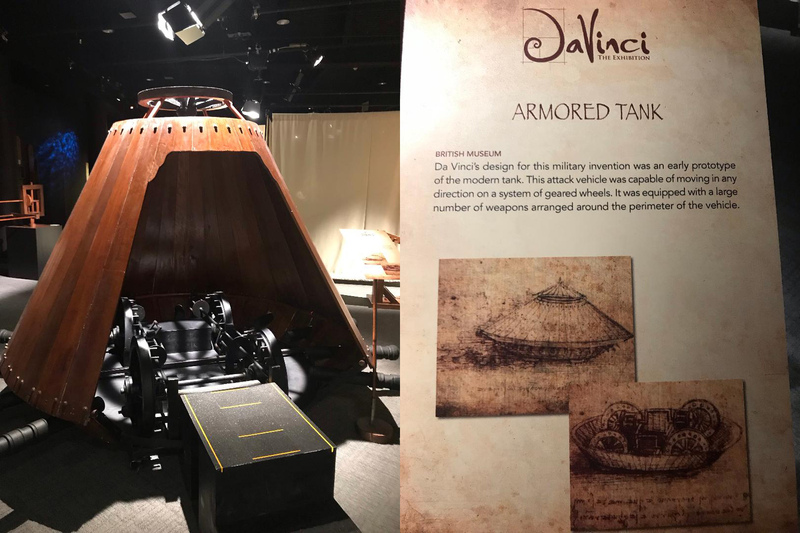 Many of the inventions he sketched on those pages have been brought to fruition in the exhibit from a prototype of a scuba diving suit, to the armored tank, the predecessor to today’s tanks, to anemometers which measure wind speeds, to civil engineering tools like pulleys and gears. There are 60 fully-constructed inventions, 31 of which are interactive and will engage the kids, if not everyone’s imagination. In addition, the exhibition features 20 replicas of his art including a wall-sized “Last Supper,” “Lady with an Ermine,” and “The Baptism of Christ,” where an enthusiastic docent pointed out da Vinci’s use of sfumato, which means “gone up in smoke,” the painting technique of softening the transition between colors. I thoroughly enjoyed the exhibit and would recommend it to young and old. While I knew a lot about Leonardo, I still learned some things. For instance, I did not know that he invented musical instruments and movable bridges, that were used in battle. The exhibit so captivated my husband, that when we came home, he launched a search on Netflix to see if he could find more information about Leonardo. To me that is the hallmark of a fine exhibit. An exhibit cannot contain everything, but a good one inspires and compels you to want to learn more. The exhibit would be suitable for middle-grade children and older, and admittance is on a timed-entry basis. We went on a Friday afternoon, and there was only one school group there, affording us ample room and time to read the accompanying materials and experiment with some of Leonardo’s inventions. I’m sure it is much more crowded on the weekends. If you can’t go to the Louvre and see the Mona Lisa in person or travel to Milan to see his fresco of the Last Supper, this is the next best thing. Tickets for the exhibit alone are: Adults – $19.95, Seniors – 17.95, Children – $15.95. Members receive a discount, as do groups. There is an up-charge to tour the rest of the Science Center.